During a trip to the island in February 2011, Dr. Civic once again spent some time at the Anguillian Animal Rescue Foundation (AARF) Shelter. They had dozens of puppies, more than their volunteers could handle. Dr. Civic took one look at those little faces and knew he had to help! 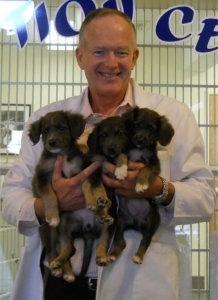 He made all the arrangements that day, and before they knew it, four lucky pups were on a plane heading to the USA! They made the journey back to Rhode Island where Dr. Civic and the staff at NAH spent countless hours socializing, training, and LOVING them everyday! Over the past few weeks, were lucky to have the opportunity to care for three of the sweetest puppies we have seen in a long time! Our staff quickly fell in love with “Captain”, “Mimi” and “Savannah”, and we were all anxious to help them find their new homes! The pups were always very playful, and were happy for all of the extra love and attention they were given. “Captain” quickly won us over with his floppy ears and feisty personality, and he always kept his sisters on their toes with his playfulness! He loved to snuggle with his caretakers, and there was certainly no shortage of volunteers to spend some extra time with the little guy! “Mimi” was our smartest little puppy– she was learning to sit at the young age of nine weeks! She loved to be around other dogs, and was always eager to explore her surroundings. “Savannah” was our big girl, and the cuddliest of the pups. She loved to be held and snuggled by anyone who came to visit her! 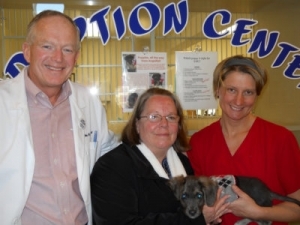 “Captain”, renamed “Calvin” was the first of the pups to find a forever home! Ms. Brown met the little guy and quickly fell in love with him. He is now getting to know his new canine friends, “Lilly” and “Bella”. We were so excited for Ms. Brown to provide Calvin with his new home, and we know she will give him all the love he deserves!